There are a lot of bad people on the internet. We can guide you on how to stay safe for free. Yes, just as there are corrupt anti-corruption government departments, there are fake anti-viruses that do exactly the opposite of what they are supposed to do. In this article, we’ll have a look at what are fake antivirus software, what they do look like, what do they do and how can one protect oneself against these fake antivirus software applications. The sad fact of life is that nothing is corruption free. You have bad police departments, expired bread and hell, even expired life-saving drugs. The online world is no different as there are “expired”, in other words, fake antivirus software applications all over the internet waiting for someone to download them and in the process of doing so destroy his/her computer machine. Of course, you can’t just ignore the antivirus software application industry altogether since surfing the web without having installed an antivirus software is sheer stupidity, to say the least. We have reached a stage in our evolution where there are over four billion people on earth who access the internet on a daily basis. That is a massive increase from the early days on the internet, especially if you consider that there are no internet before the 1990s. And because there are so many people on the internet on a daily basis who have to go about their daily basis while being connected to the internet, there are an ever increasing number of cybercriminals who lurk in the shadows, waiting for opportunities to strike at the opposition or at least those opposition who don’t come prepared. Cybercriminals along with other hackers now have more incentive than ever to attack people who surf the internet without any sort of protection and for food reason. The more people there are on the internet, the more number of credit cards they would have and the more number of credit card holders there are on the internet in terms of their relevant information, the more are the chances for cyber criminals to take action and make away with someone’s money. And yes, it is also true that there are over seven billion people on earth and most of them are not connected to the internet at this moment in time. In the future, the only way the number of users on the internet is going is upwards. The internet and the commerce that happens in the online world will continue to grow for the considerable foreseeable future and that makes the online world a really rewarding place for cyber criminals and other types of hackers. This will also remain the case for many many years to come since, since even now (in the year 2017) most businesses have not realized the true potential of the internet. As soon as they do, they too will shift most of their commerce to the online world and that will give cyber criminals along with hackers more opportunities to hack people and run away with their hard earned money. Not everyone shiny piece of software is a real one. Stay on your guard. The first and foremost thing you can do to protect yourself against these cyber criminals and hackers is to have some form of protection for yourself and your computer machine when you are connected to the internet. It doesn’t matter if you use your computer, laptop or even tablet at home, in public or in office, with the amount of cyber criminals and hackers out there in the open, you need to have protection all the time in order to safeguard your identity and privacy when you’re doing work in the online world. We already know that, to protect your identity, you need to sign up for a VPN service but here, we’re talking about a different protection service. Here we are talking about downloading, installing and then running a firewall and a good antivirus software program on your computer machine regardless of your operating system unless you run the Linux operating system. Most of you probably already know that the Microsoft Windows is the world’s most popular operating system and since it is so popular, the manufacturers of this piece of software have made sure to include some vital protection tools such as a firewall and an antivirus program by default in order to protect the average Windows user from the start. In other words, if you have Windows installed on your machine, you’re pretty much safe because Microsoft Windows comes pre-installed with everything you need to protect your machine from online cyber criminals and other hackers. But as with all default things, they aren’t the best at what they do. While Microsoft Windows has made some tremendous efforts in trying to improve the default system software, the fact remains that the current default antivirus program and firewall are just insufficient when it comes to modern viruses and malware. But even if that wasn’t true, what if someone wanted a bit of extra protection for their computer machine in order to guard their data and protect their privacy? Of course, there are antivirus software applications out there that are regarded way better and more robust than that of Microsoft Windows, so it is understandable that some folks might want to try out different antivirus software programs. So, of all the alternatives which one is the best or which one should you go for if you are not satisfied with the default ones? Well, let’s just get this out of the way first: there are tons of places on the internet where you can get a good antivirus software application program and all you really need to do is to know how to and where to look for them. To make things easier for the end-user there are many authoritative and genuine review websites out there that point you out in the right direction when it comes to selecting the right antivirus program or the right VPN software program. One of those sites is this one and we certainly hope that you’ll read some of our software application reviews before going online and downloading another piece of software for your computer machine. With that said, we’ve been around the game long enough to know that there are always those folks who won’t bother with reviews or just won’t trust them as they would trust their own sixth sense, instead they would just surf the internet without an antivirus software application installed on their machines or, at best, look for a free antivirus program in the process of saving up some money and some headache as well since you don’t have to actually get out your credit card and pay for a piece of software for your computer. There will also be those users who will just download a paid version of a good antivirus software application program from a torrent site, thinking that they’re getting a good deal since they’re downloading one of the world’s top antivirus software application program without even spending a single dime. Of course, we won’t judge you if you go ahead and do that since to each his own, there are people out there in third world countries who don’t even have enough money to send their children to school or eat a good quality meal, but we will though through in there a warning. If you go ahead and download free software without reading reviews or download the top rated ones from torrent websites then you run the risk of infecting your computer machine with an unknown and a uncountable number of viruses and malware. Downloading illegal software is not only against the law in many countries but also very dangerous for your computer machine. Downloading illegal software takes you away from the realm of what is good about the internet and takes you down the pits of its ugliness. And that leads us to our very important topics for today’s article. There are a variety of ways cyber criminals will try to con you while you’re online. 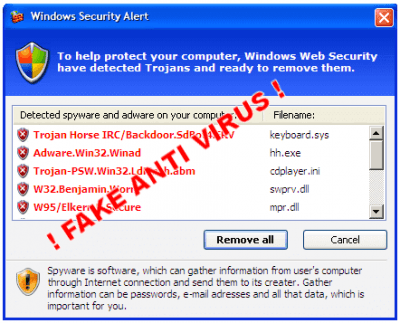 There are many ways a fake antivirus software application can creep into your system. Some of which we have already discussed before in this very post but we’ll reiterate them again just to make sure that we are on the same page. The easiest way to get fake antivirus software application on your system is by downloading a perfectly legitimate antivirus software program from a torrent site onto your computer because even though these software applications are in themselves genuine and legit, they have been tampered with by the uploader of these files to the specific torrent site. A torrent site is good for a lot of things, such as downloading Linux ISOs, but antivirus software application isn’t one of those things. 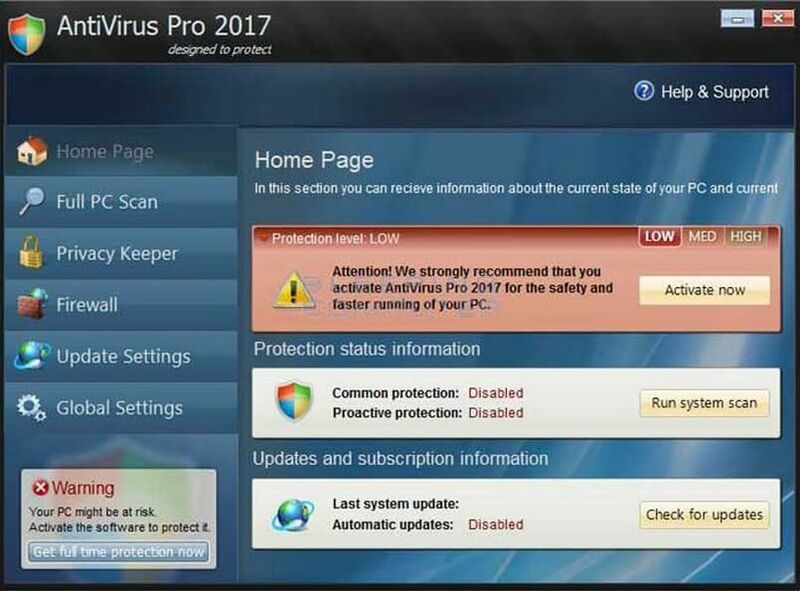 You can also get fake antivirus software applications on your computer system by downloading a relatively unknown antivirus software application from an obscure company that doesn’t have any reviews on top websites and with no awards to show for its performance. This is the second most common way people install fake antivirus software applications on their systems. Apart from that, the simplest way cyber criminals and hackers infect your computer with fake antivirus software applications is by showing you a fake antivirus pop-up that demands some sort of interaction with the user of the system. But we’re getting ahead of ourselves here, first, we need to make sure that readers absolutely understand that all antivirus software programs are not created equal. They all may say that they are the “bestest, fastest, securest and the most wonderful antivirus” software in the world, but the actual fact is that they are not. Some antivirus software application is better at blocking malware than some of the other more reputed ones while others are easier to use by users who are new to the antivirus industry. There are also antivirus programs that try their best to not have an impact on your computer performance while other bog down your machine to an absolute halt. And then there are those, that are not real at all. Yes, there are also fake antivirus software applications. These are the ones you need to stay away from while you surf the internet looking for some sort of protection. 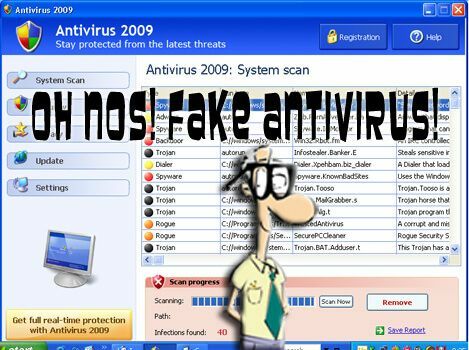 Fake antivirus software applications are spread throughout the online world by nasty people such as cyber criminals, hackers, identity thieves along with scammers and criminals who just want to take away your money and possibly harm your computer machine as well. There are also hackers out there who don’t want your money but just want you to install their fake antivirus software applications on your machine so that they can steal your vital private information and data for their own evil designs. Always read trusted reviews about any software you’re about to download. They could be after your bank credentials or even your personal data so that they could compromise your online banking transactions. Hackers, sometimes, also want to use your computer for its bandwidth so that they can use your machine as a part of a larger botnet to carry out DDoS attacks on critical internet infrastructure. But hackers have other friends too, these are sometimes known as scammers. Scammers, basically advertise fake antivirus software applications so that they can make direct cash off unwary customers. They don’t want to steal your information or use your machine for larger attacks, they just want to swindle you with your money and, after selling you junk software instead of the real one, run away into the infinite online world. Don’t worry, you won’t be able to catch them because they probably did not contact you with their true identities. There are also those lucky online users who don’t get sold junk software, they count their lucky stars when they find out that they were ONLY sold a poor piece of software program that didn’t do anything of what it advertised it would. But of course, not everyone’s that lucky, sometimes you get sold a hideous piece of software that not only costs you money but also messes up with your computer machine and cause you many other problems in the future as well because they are so hard to remove once they gain entry to your computer machine. We’ll talk more about these criminals in the future parts of this post so stay tuned. Think about what we have said in this post and try to understand how the online market works. In the next part of the series, we’ll talk about some of the other ways cyber criminals and hackers try to influence you and damage you in ways you might not have thought possible before. For the second part of this post, go here.